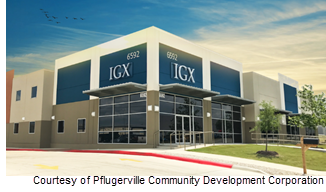 ​​​​​ PFLUGERVILLE – San Antonio-based IGX Consolidated LLC is expanding its Central Texas footprint with plans to construct several office-industrial flex buildings. The city council agreed to the sale of a 24-acre tract near Pecan St. and SH 130 for $3.4 million. Dubbed Pecan Park at Pflugerville, the sale checks one of the last boxes for building out the suburb's 130 Business Park. Preliminary plans depict about 205,064 sf spread across seven buildings ranging from 8,600 to 45,000 sf.